A wannabe robber in the American state of Florida returned nearly empty-handed after he tried to rob a pharmacy at gunpoint. He was thrown off by the cashier's intense staring. Police released surveillance video of the shocking robbery attempt and asked for information about the suspect. On Monday night, the suspect entered the pharmacy and grabbed some candy and ice cream. As the cashier starting billing the items, the suspect reached out for his handgun and demanded cash while pointing the gun in the store clerk's face. What happened next was the most epic stare-down ever seen. The cashier, while still calm, stared at the suspect for a good 15 seconds eventually making him give up and leave. Note: Despite a gun in his face, the cashier bagged the items and handed them to the gunman. The suspect didn't get any money but got away with candy and ice cream worth six dollars. The cool-as-a-cucumber cashier explained why he had no reason to be scared. "I honestly didn't see a reason to. He seemed like an amateur," 26-year-old Jayson Shipp told The Sun Sentinel. Police, however, warned that in case of armed robberies one should cooperate with the robber instead of risking their lives. 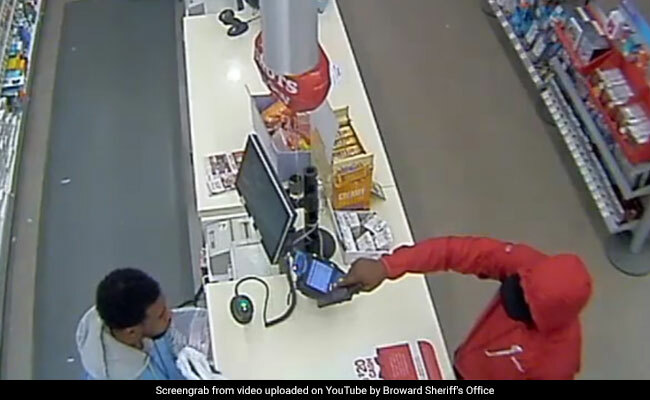 "Even this kind of quiet resistance is dangerous, but luckily for this clerk, it worked out in his favor," Broward Sheriff's Office spokesperson Gina Carter told wsvn.com.